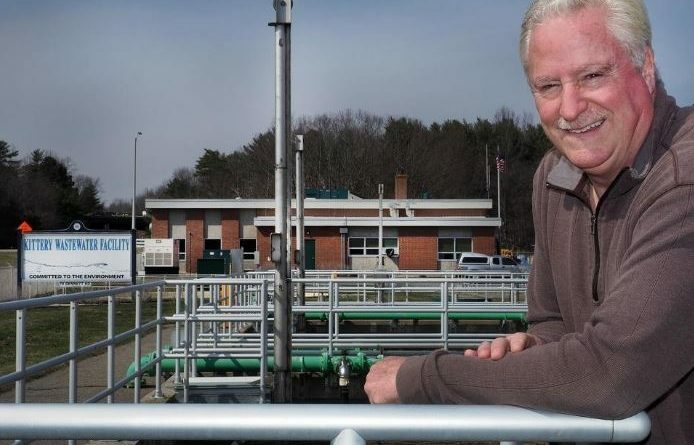 George Kathios, superintendent of sewer services at the Kittery Wastewater Treatment facility on Dennett Road. KITTERY, Maine — Residents may face increased sewer charges to ensure the solvency of the sewer enterprise fund. Engineering firm Woodard and Curran’s vice president Toby Fedder and principal senior project manager Tom Schwarz presented results of their examination of the sewer enterprise fund’s balance and wastewater treatment operations to the Town Council Monday. According to town data, the sewer enterprise fund currently owes the town general fund $1.2 million. It runs an annual deficit of more than $200,000 and if no action is taken, Fedder anticipated it could see annual debt of $250,000 by Fiscal Year 2023. That would negatively impact the town’s interest rate when it applies for a municipal bond in a future for projects like the Rice Library expansion. Town Manager Kendra Amaral said she has been concerned about the sewer fund since she joined the town in 2016. Amaral will present a recommendation to the Town Council to propose raising residents’ quarterly sewer fees to $125 and increasing the volumetric rate for use beyond the first 1,000 cubic feet of sewage flow to $8.94 to return to financial stability within five years. The rate increase would be the first since 2008. Amaral said the new structure would repay the general fund, contain future capital sewer expenditures in the enterprise fund and retain a 90-day operating cost reserve of 10 percent and an additional 10 to 15 percent standard reserve. The wastewater treatment plant processes 2.5 million gallons of waste per day, according to town statistics. Amaral said the sewer enterprise fund had been managed based on accrual accounting principles and the payment on sewer’s annual debt principal was not reflected in the operating budget. “It was masking the fact that if we’re only raising $100,000 and we’re actually sending out the door $150,000, you really couldn’t account for $50,000 of that because it was showing up as (debt payments), as opposed to sort of the checkbook approach to managing an account,” Amaral said. Residents’ $75 quarterly sewer fees and $5 volumetric fees account for 60 percent of the sewer enterprise fund’s revenue. The majority of the remaining 40 percent is generated by the use of Kittery’s sewer system by Portsmouth Naval Shipyard and the town of Eliot. Contracts with both stipulate they pay the percentage of the wastewater plant’s costs for the percentage of the sewer they use. Amaral said Eliot has a 10-year contract that was renegotiated in 2015 and the shipyard’s contract has been renewed year-over-year since 1987. She said revisiting terms of both contracts is on the table. Amaral said she understands a rate hike’s impact on residents, but added if revenues increase more than projected in the next few years that may stave off another increase. She said many municipalities raise sewer rates slowly and consistently over time.